Noritake made this beautiful bowl, which is pictured on page 115 of Joan Van Patten's 1994 Collector's Encyclopedia of Noritake, Second Series. 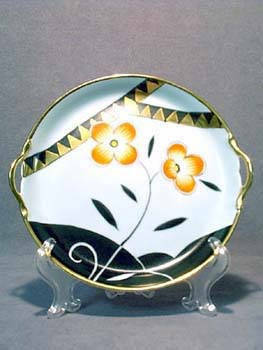 Measuring 7-1/2" from handle to handle, it features a stunning poppy with a stark black and gold design on a soft blue background. Richly trimmed in gold, this lovely bowl carries Noritake's red Backstamp #27, which dates it to as early as 1918. It is in near mine condition, with only the very slightest wear to the gold trim.